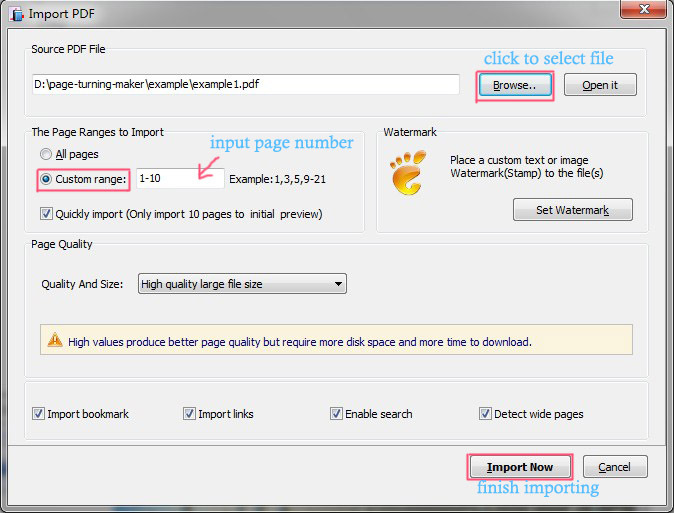 Customize a page range for converting with Page Turning for PDF. Can I customize a page range for converting to page turning book with Page Turning for PDF? Q: I want to have my PDF file converted to page turning book, but I just need part of PDF. Can I select specific pages to be converted? 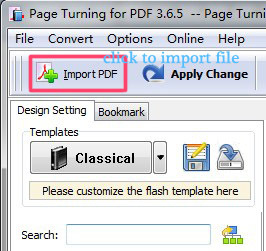 Step 1: Start Page Turning for PDF(Mac), then click "Import PDF" button in the toolbar to open the Import PDF window. Step 2: In opened window, choose "Browser" icon to navigate file browser to locate the PDF file you want to convert. Step 3: Select "Custom range" option and input the page range wanted in the following text box, e.g. 1, 3-10, 15(separate numbers with commas). Then click "Import Now" to finish converting. After the steps above, you have import the wanted pages. And you can start design your page turning book. NOTE: Page Turning Pro for PDF, Page Turning Pro for PDF Mac and Page Turning for PDF Mac support this function too.